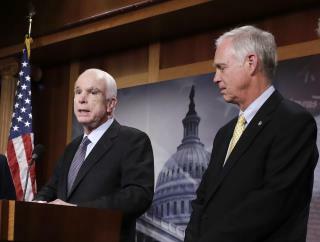 (Newser) – A GOP senator is backtracking after controversial comments about John McCain Tuesday. Speaking about the Senate's failure to pass a bill repealing ObamaCare on the AM560 radio show Chicago's Morning Answer, Sen. Ron Johnson of Wisconsin said, "I'm not gonna speak for John McCain—he has a brain tumor right now—that vote occurred at 1:30 in the morning, some of that might have factored in." In response to the host's incredulous "really?" Johnson replied, "Again, I-I-I don't know exactly what—we really thought—and again I don't want speak for any senator. I really thought John was going to vote yes to send that to conference at 10:30 at night. By about 1, 1:30, he voted no. So you have talk to John in terms what was on his mind." Psycho McCain; but with an agenda. He is controlled by at least two factions: Mormans and Vatican, both are linked. AZ has long been Mormon controlled since the Civil War. Right across the Mexican border was the Mormon polygamy exodus upon learning that Abe was winning. So much history. With McCain, just a tool of POW psycho stress, born outside the US, thinking he can be legal President as Obama conned the Zbig controlled nation with his fake birth certificate, he can circumvent the Constitution like all the other organized Trilateral and CFR commission Marxist-Fascist-Imperial-Secret Society-military-corporation networks do. And no, there's absolutely no conspiracies concerning the greatest power nation upon the planet that ever existed! Everything is so so so simple! In a world of corruption and psychos running things. Right.